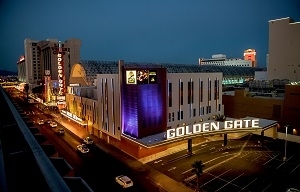 The Golden Gate is Las Vegas' most historic hotel and casino, opening in 1906 at One Fremont Street. Its legacy spans the birth of Las Vegas, the Roaring 20s and the Rat Pack era. The Golden Gate recently completed its first major expansion in 50 years, adding a 35,000-square-foot luxury tower with 16 suites, an expanded gaming floor with a high-limit pit featuring its signature dancing dealers, and a new lobby displaying artifacts from its historical past. The result is an intimate, boutique hotel/casino that is energetic and contemporary, yet preserves its historic character. It is conveniently located at the entrance to the Fremont Street Experience with the biggest video screen on the planet - 10 stories tall and 4 blocks long, featuring free indescribable light shows. The Golden Gate started a Las Vegas tradition when it introduced its world famous shrimp cocktail in 1959. What happens in Vegas ... started here! The hotel's new luxury suites present a fresh and contemporary feel, blended with styling that spans the decades. Each is themed with Swing era-inspired pinstriped carpeting; Art Deco accents; and a photograph of an iconic Las Vegas celebrity, many of whom frequented Golden Gate. All suites are climate-controlled with motion sensors and boast a 50-inch HD flat-screen TV, California king bed and sectional sofa with a queen-size pullout. The Golden Gate also features 106 recently remodeled rooms that date back to the 1906 opening. A new high-limit gaming area is wrapped in rich colors and styling from the Roaring 20s, including fringe-lined walls inspired by flapper dresses. The setting is intimate, offering gamblers a semi-private environment to bet big with a prime view of the casino and signature dancing dealers. The casino's credit program and higher table limits appeal to high-end players looking for a boutique gaming experience with traditional odds. The expanded casino floor continues to offer the highest "free play" reward in town and features the latest in slots and video alongside craps, blackjack and newer table games. Blackjacks always pay 3 to 2 and you can still find 10 times odds on dice. Take a few easy steps outside onto the Fremont Street Experience where the world's biggest video screen - Viva Vision - towers over four neon blocks of party action including three stages, a zipline overhead and bars wherever you turn. Everything is close, so you can spend less time walking and more time dancing in the street. In 1955, Golden Gate founding partner and restaurateur, Tiny Naylor, brought his special brand of home cooking to Las Vegas' most historic hotel and casino. Today, Tiny's son, Biff, serves classic recipes with the same fresh, homemade quality. 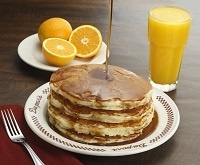 Du-Par's serves the "Best Pancakes in America" (Esquire Magazine), "Best Pie in Las Vegas (Las Vegas Weekly Magazine), and was named one of the "Top Five 24-hour Diners in Las Vegas." When Golden Gate partner Italo Ghelfi introduced shrimp cocktail to the casino scene in 1959, he started a Las Vegas tradition. Since then, the Golden Gate has served more than 40 million and locals vote the Golden Gate's shrimp cocktail "Best of Las Vegas" year after year! 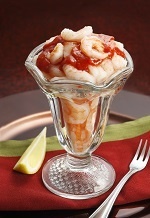 Las Vegas' Original Shrimp Cocktail is still served in Du-pars and boasts a heap of ocean shrimp in a classic "tulip" sundae glass, served with Golden Gate's secret cocktail sauce and a wedge of fresh lemon. The price? Only $3.99! With three dynamic bars on property, guests can choose to take in beautiful bikini-clad bartenders at OneBar, be dazzled by flashy tricks at Flair Bar or tip their glass where Frank and Sammy once drank inside the casino while sipping on a prohibition-inspired cocktail.